Oculus: quite a frightful sight (in a good way)! 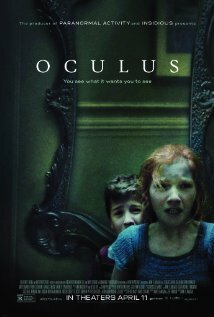 Putting my head above the parapet to share some quick reflections on Oculus, director and co-writer Mike Flanagan’s superb horror flick from last year worth looking into. As the puns suggest, it is about a mirror. A haunted mirror. It is no laughing matter. Dr Who‘s Karen Gillan and Aussie Brenton Thwaites play Kaylie and Tim, reunited after Tim’s got out of a psych clinic years after a horrific incident of apparent domestic abuse. 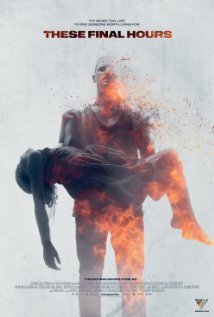 The movie cleverly merges that past trauma, with young actors Annalise Basso and Garrett Ryan giving wonderful performances, with the present as the nature of the mirror is revealed. Illusion, obsession and confusion reign. Horror results. Do not watch this movie if you’re feeling down. Unlike this year’s similar and, indeed, similarly superb, Aussie effort Babadook, there’s precious little hope or light to be found here — it is perhaps my only quibble, from a thematic basis. But the narrative plays out truthfully and unapologetically. I loved the quiet, building dread of this movie (enhanced by its subtle score), and the brilliant editing as timelines meet — no cheap, screaming string section; no gotcha! jump cuts. The relationship between brother and sister is well drawn, their actions and reactions believable and intelligent. And by the end of the movie, boy, did Kirstyn and I hate that mirror. Battlestar Galactica‘s Katee Sackhoff is also among the cast, but in this instance, it’s a case of no cigar for her character. 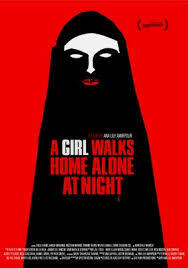 It’s great to see some clever, psychologically astute horror films around. Another recent viewing was this year’s Irish movie The Canal; alas, it didn’t hold together as tightly as the two mentioned above, and was soundly let down by its bob-each-way ending. Worth a look, though — there’s a public toilet that Candyman would be proud of. Jim Jarmusch takes the long, slow road to a vampire movie aimed squarely at what happens when you use up resources, but yet, there will still be music. 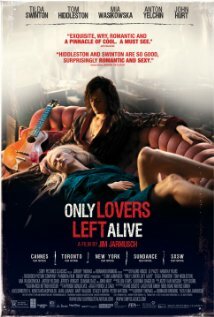 Only Lovers Left Alive (2013) features Eve (Tilda Swinton), well read and generally wonderful, reconnecting with her significant other, Adam (Tom Hiddleston). She travels from Tangier, leaving behind good old mate Christopher Marlowe — played with the usual aplomb by John Hurt — to Detroit, where the collapse and abandonment mirrors Adam’s depression. Adam’s a muso of modest but enduring renown, and things are looking all right for the reunited lovers until Eve’s sister Ava (Mia Wasikowska) turns up to rock the boat with her over-eager, insatiable consumerism. Because things are already tense for the children of the night, with the blood supply as tainted as the environment. Resources are getting scarce. The good stuff is in demand. And the food chain, and decency, are such fragile things. It’s a slow-burner, shot almost doco style as Adam and Eve drive through derelict suburbs, living their lives in splendid and not-so-splendid isolation. The vampire culture is wonderfully (under)drawn, with its own peccadilloes and gentle in-joke references. Living in the shadows, observers trying to find safe ways to interact, to leave a mark, however anonymously … the settings mirror the desolation, even Tangier — necessarily by night — an empty place where people offer only what is not needed. And the leads capture the mood perfectly. Swinton’s nuanced performance is a delight, and Hiddleston has the disaffected rock star air down pat. It’s crafty, too, how at least one certain prop never gets to satisfy the Chekhov law, although perhaps that’s a Jarmusch law. Along with the music, of course. As the predators prowl the decaying streets, the message is there in the coyote howls: nature will have its way, so we’d better look after it. The Babadook is an Australian horror movie. It’s clever without being pompous or overwrought. A suburban working mother is trying to raise her needy son while stricken by grief over her husband’s death. Then a book is found, and it tells of the Babadook, who once it gets in, can never be got out. The heroine is a working single mother, whose hair is in disarray, who looks shattered from the opening frame. The heroine does not wear makeup, except for the one time she does in company who wear it better. This tells us a lot. When the heroine screams, it is not a screech. it sounds real. The acting is uniformly superb, but lead Amelia (Essie Davis) and son Samuel (Noah Wiseman) are particularly brilliant as they carry the emotional journey. There are no aural tricks to make the audience jump. There are no jump cuts to make the audience jump. Possibly, this makes it even creepier, perhaps because tropes are used — opening doors, creaking floors, fleeting shadows, popping lightbulbs. Sound is wonderfully adept at creating mood without intruding or being overtly manipulating. The kid is a weird little guy in his own way, and despite his Home Alone precociousness in the arena of home defence, he is just a kid. The characters act naturally, resulting in increasing isolation and dislocation for the heroine. Mostly through her own decisions. There are no villains, just people trying to deal. The heroine does bad things, but she is not an image of hate or scorn. There is no happy ending, but rather, progress, and ongoing struggle with the hope of some kind of equilibrium. The setting reflects the character’s mental and emotional state. Facts about the characters that inform the story are introduced with subtlety that urge a re-watching to fully appreciate just how well sewn this tapestry is — a few, minor dangling threads notwithstanding. The symbolism is clever and consistent but not pretentious. You want to talk about grief, depression, dysfunction in an engaging and oblique fashion — the personal cost and the impact on family, friends and those around — this is the perfect example of how a horror story can do that. I hope writer/director Jennifer Kent, who adapted this feature from her short film, Monster, gets support for her next project. She went to Kickstarter to help this one get across the line, and has rewarded those supporters handsomely.